Given the widespread popularity and use of wallpaper, kitchens are no exception. Increasingly we see a multitude of wallpaper choice, texture and variants specially designed and created for the kitchen. While kitchen wallpaper can easily transform the kitchen into a sleek looking beautifully decorated culinary hub. But maintaining it like new could be a challenge many a times. This is where a professional wallpaper expert like our firm fits into the picture. We not only specialize in providing quality wallpaper products and installing them but also help our clients in maintaining them like new even years after having installed. Why Is Kitchen Wallpaper Important? We recommend kitchen wallpaper to many of our clients undertaking renovation work at their homes or redoing the décor in their houses. This isn’t because a wallpaper installation would mean hefty profits for us but more because they appeal to design aesthetics beautifully and can easily lift the get-up in the kitchen, making it a far brighter and nicer place to work. Kitchen wallpaper and break the drab monotony and introduce an offbeat theme. Maintenance of kitchen wallpaper can be quite an uphill task if not done properly. 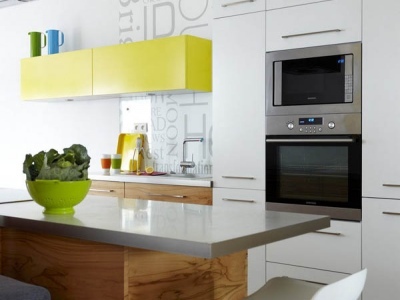 They can even result in tear and add to the untidy and shabby look of a badly maintained kitchen. With us around, that’s never going to be a problem. Here are some of the top techniques used by us for regular cleaning and maintenance of kitchen wallpaper and helping them continue to look like new even after months and years of having installed them and despite usual wear and tear of such installations. Wallpaper Dough: It is a unique mix we use to remove such stains and stubborn marks where water might be ineffective. This dough is made into small ball size portions and roiled over the wallpaper to attract all possible dust on to it. Vacuum Cleaning: This is another convenient technique for delicate wallpapers or those that might run the risk of being ruined easily. Normally vacuums with soft brush attachment at the end work the best for these. Light Washing: For clients with whom we have the contracts, we wash these vinyl coated kitchen wallpapers with water every once in a while. This prevents the dust from settling down or attacking more dirt in return. Our quality service and diligent follow-up have won us many accolades and the biggest acknowledgement has been returning clients who are convinced about or are confident about the end product that we promise. If you are struggling to keep your kitchen wallpaper spick and span, all you need to do is give us a call. We will ensure that everything from installing new ones to caring for the old wallpapers is addressed and every client’s specific needs is given prominence.